Sometimes very wants to pamper loved ones some variety in the kitchen, to be delicious, unusual and easy to prepare. Here is what we remember about burritos, Mexican dish. Here is his recipe. 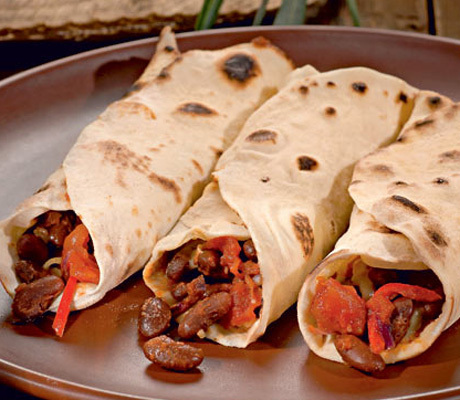 If you are unable to visit other countries, but really love a variety of cuisines and especially spicy food, pay attention to the method of cooking a burrito (it's reminiscent of a Turkish Doner kebab). How to cook a burrito? First of all, you need to make the filling, the main component of the dish. Just how fresh, spicy it will be, depends the success of the dishes. In the preparation of the filling for burritos you can experiment, and every time you have a new burrito. Most importantly - do not skimp on spices, spicy seasonings. From meat, of course, depends on the taste of your Mexican dishes. So don't be lazy and buy ready-made at the store or market. Take a fresh fillet (of beef, but chicken, it all depends on your eating habits), chopped meat through a meat grinder, generously adding onions. Minced salt, add black and red pepper. Then make small portions of meat, something like a flatbread. Pour into pre-heated pan of oil, vegetable or olive (to taste) and sacarifice your meat cakes. When the meat patties turn Golden (but pellet should not be completely cooked, they still need to will be stuffed with vegetables), add diced fresh tomatoes (no tomatoes, you can lubricate meat tortillas tomato paste). Then dice sweet bell peppers, experiment with color. Food should be not only palatable but beautiful. Add to the pan the chopped bell pepper. Cover the pan, let everything simmer for 10 minutes on low heat. Grate the cheese (kind of cheese – to your taste), add the grated cheese to the pan. It should melt and cover in a film of your entire filling. Optionally, you can add greenery. Do not overdo the salt, because cheese is so salty. Take a tortilla or pita bread, add the filling, roll the envelope or tube. Burrito finished then you will need to reheat in a pan or in the oven, the dish was warm and tasty. Spices, besides pepper, add to taste. It all depends on how spicy food you prefer.